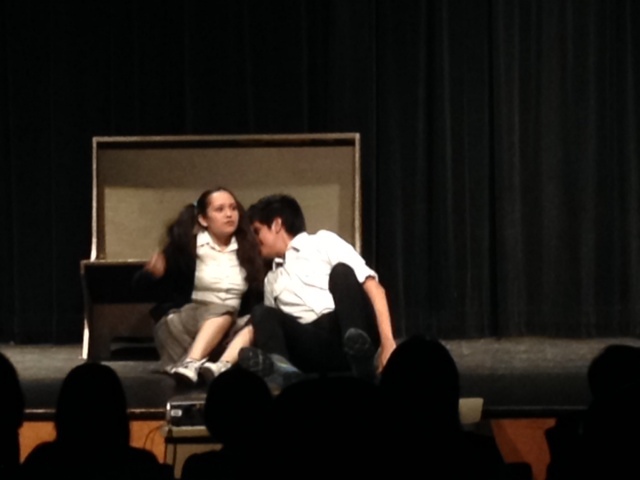 On April 28th and 29th, students from Beginning and Advanced Drama performed in various one acts and short scenes for friends and family in the AHS Little Theatre. Cinderella was an incredible endeavor that took a great deal of hard work from the cast, crew, and musicians. Each performance was magical, and will never be forgotten! 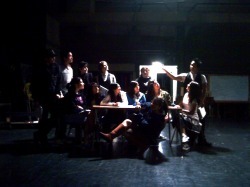 Mayra Aguilar, Arturo Cuevas, Kristy Li, Michelle Yan, and Lesly Mercado. 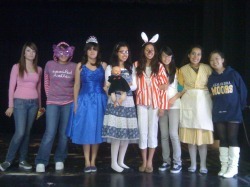 Lorena Coronel, Sergio Ferreira, Carina Iraheta, Natalie Villarreal, and Aileen Wei. 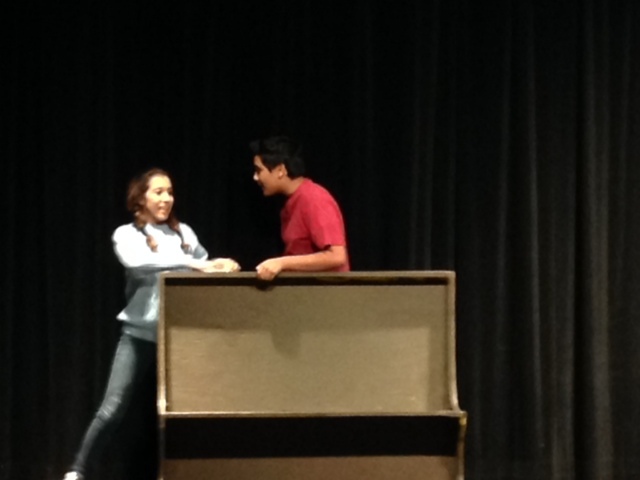 "How To Succeed In Script Writing Without Really Trying"
Eric Morales, and Brianna Sandoval. 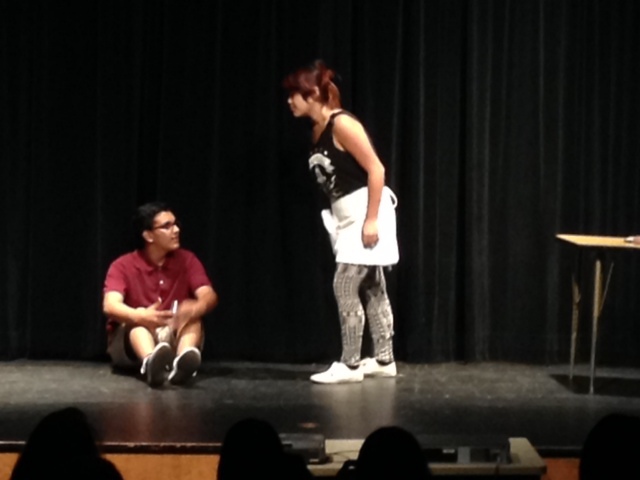 "The Butler Did It" is a Murder Mystery Farce poking all sorts of fun at the genre! A group of mystery writers come for a weekend party at Ravenswood Manor on Turkey Island hoping to gain favor with the spinster Miss Maple, only to have their weekend turned upside down when a real murder occurs with the killer loose somewhere in the house! 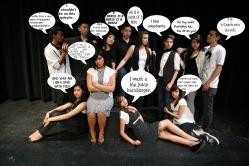 Staring Barbara Cobos, Jamie Risch, Aly Santana, Lesly Mercado, William Martinez, Brianna Sandoval, Eric Martinez, Mayra Aguilar, Sergio Fierrera, and Samantha Gonzalez. This year we welcomed everyone to The Nightmare Institute where our worst dreams came to life. Full of bugs, zombies, aliens, monsters under the bed, clowns, asylums, and serial killers in the basement! It was so scary! 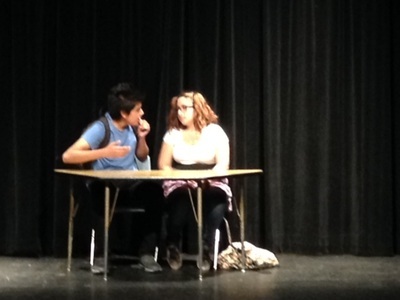 Student directed one acts. All with the theme of Love and Dating! 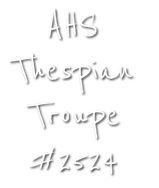 Student from Beginning and Advanced Drama directed and performed in scenes and one acts over two evenings in the Little Theatre. Footloose the Musical takes you through the new life of Ren McCormack in the small town of Bomont where he faces a local law in which dancing is prohibited. Ren, along with some new friends fight the law and show the town that dancing is awesome! 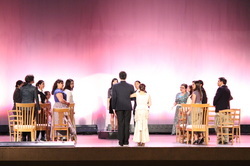 With a cast and crew of over 50 students, the production also included a live band made up of students and alumni (directed by Mr. Trulson), as well as the three dance classes on campus (choreographed by Ms. Fong). Advanced Drama Students wrote, directed, and performed in their own original scenes on March 4th and 5th in the Little Theatre. 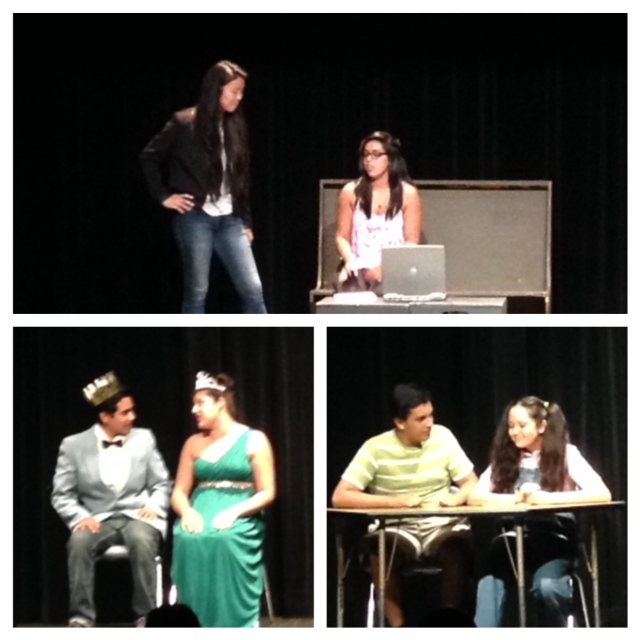 The scenes ranged from the dilemmas of dating, to supernatural, to magical, and were all a big hit! These are sure to be a new staple here at AHS! Shakespeare's great comedy "A Midsummer Night's Dream" is revamped and set in the modern day Jersey Shore. With guidos running away to get married, an acting troupe or hair stylists, and beach loving fairies, this truly is one fun show! 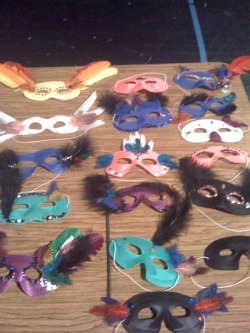 This years theme was Carnival of Freaks! Complete with crazy clowns and freaks all around! The tale of several socially awkward kids finding joy, heartache and a purpose in competing at the regional spelling bee. 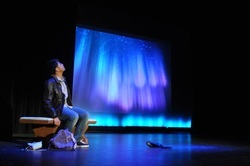 Nine short plays by John Cariani that explore love and loss in a remote, mythical, almost-town called Almost, Maine. Set in the 1930s, this interpretation shines light on Shakespeare's original themes of gender inequality and propriety through the lens of the prohibition era and women's suffrage. If music be the food of love, play on! This year's theme, Twisted Fairytales, explores the darker side of children's stories. If you like scary stories and twisting mazes, this event will not disappoint. A charming adaptation of Lewis Carroll's fantasy novel comes to life on the stage! Charlie Brown is a modern-day Everyman. A teen's unique perspective on the world finds its voice in this Advanced Drama production. Be sucked into the world of a children's nightmare... Phantasm provides a family friendly experience that still manages to scare you. Beware of those that seem they're your friends. Our Town explores the life of Emily Webb in a small town in New Hampshire during the early 1900's. Two one acts about the ways in which we perceive the world around us. A series of student-directed one act plays, performed during lunch and after school. Featuring Check Please by Jonathan Rand and 4 a.m. by Jonathan Dorf. 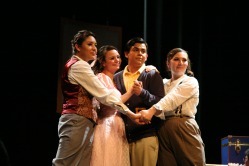 The Fantasticks is a musical about accepting true love, even when things aren't perfect. Spoon River Anthology is based on an anthology of poems by Edgar Lee Masters. It chronicles the lives of citizens of Spoon River, IL, and explores the way lives of people become entwined. Planned and run completely by students, our first annual Haunted House was a great success! Look for an improved version in October of 2010. Beginning Drama presented a one-hour version of Shakespeare's Much Ado About Nothing. The Dining Room, by A.R. Gurney, explores the relationships between family members and the homes they inhabit. 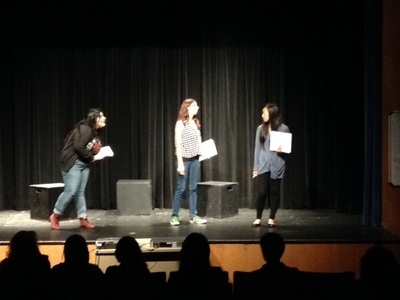 Beginning Drama ends the year with lunch time performances of student-directed one act plays. Rumors, by Neil Simon, is about the chaos that ensues when members of a dinner party do not know the truth.